Perry Green remembers his first check of $14 in the army. He was disappointed since he knew this would not be enough and he wanted to change this situation. He did not know that his salvation would come in the form of clubs, spades, diamonds and hearts. He got involved in some barracks games in Carmel, Calif where he changed his fortune by winning $1,000. He was later transferred to teletype school in Fort Gordon, Georgia and his bankroll continued to grow through poker. He still has the skill and still sharp even after many days of getting into the Army games. As he grew up in Alaska, Perry was in love with the outdoors. He loved fishing and hunting. When he completed his high school education, he joined the Army and worked in communication before Alaska was a state. He lives in Anchorage and loves it. He cannot imagine living anywhere else. He adds that Alaska is one of the most wonderful places to grow up and the place is still beautiful the only difference now is that more Californians are in the state trying to change it like California. If you are also looking for a wonderful place to get poker insights and knowledge, Worldpokerdeals – online poker rockstars is your place. I believe green would love the site like he loves Alaska. After Green left the service, he worked as a fur buyer and began heading out on a regular basis to Sin City and this is where his poker success continued. He says that his first time in Las Vegas was in 1958 and this is before everyone playing in the tournament was born. He says that Las Vegas was friendlier during the time than it is now. At the time you knew all casino owners and they knew their players. He adds that they were fair and gave the players a good gamble and incredible accommodations. He specifically remembers Jack Binion and the Binion family. 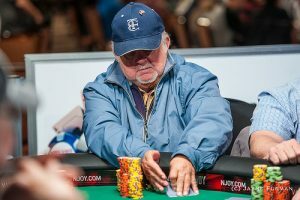 Green is a three time bracelet winner who has played in the WSOP since the 1970s. He tries to make it back to the tournament once or twice every summer. When it comes the game of A-5 Lowball, he has great skills at it. He won the $1000 event in 1976 for $68.300 and won the $500 version for a second time in 1977 although it only had two players. He earned his third bracelet in 1979 when he won a $1500 No Limit Hold’em event for $79,500. In 1981, green finished second to Stu Ungar in the Main event and walked home with $150,000. This was followed by plenty of multiple cash wins and final tables even at a time when he was eighth place in the Super Senior event in 2015. Green has had lifetime tournament winnings of $1.2 million. He has seen great growth in the industry since the early days in Las Vegas. At this time when he was playing, he says that he is doing it for fun and he does not expect to cash out. He is playing for the mental exercise. He did not walk empty handed as he walked with a mini cash win of $3,777 which is not bad considering that there are younger and more experienced players. Green has 5 children, 13 grandchildren and 6 great-grandchildren. He has been married to his wife for 62 years. This entry was posted on Friday, June 29th, 2018 at 9:47 am and is filed under Poker News. You can follow any responses to this entry through the RSS 2.0 feed. Responses are currently closed, but you can trackback from your own site.